What else is there to do on April 30th? Build a playground at Propel East in Turtle Creek, PA? Participate in a community cleanup in Braddock, PA? 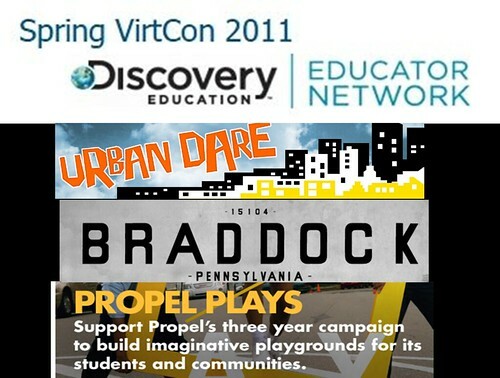 Participate in the 2011 DEN Virtual Conference in-person event at Propel Braddock Hills? Participate in Urban Dare in downtown Pittsburgh? Of course I have a decision or two to make. I will definitely be attending the DEN Virtual Conference with my fellow DEN LC members in addition to many of my colleagues from Propel. I would encourage all of you to attend Propel Braddock Hills for this event as well. DEN Guru Traci Blazosky will be sharing many of her incredible classroom ideas while making use of the many Discovery resources. In addition, DEN LC member Jan Abernethy will also be sharing how she integrates Web 2.0 tools with her “Creative Cougars.” Matt Strine, will also be doing a number of great presentations throughout the day will share his many awesome integration ideas that he has been using this year as the new Director of Instructional Technology at Propel. Please continue to encourage your peers to attend as this will be another awesome event that Propel will host. Please CLICK HERE to register. Of our many goals for the day, we would like everyone to walk about registered to be a Discovery STAR Educator. Come and make this one of the best in-person events in PA. There will be great food, ideas, and prizes throughout the day! Hhmmm….I wonder how those Buccos have been doing this year?